Impact-echo is an acoustic method for nondestructive evaluation of concrete and masonry, invented at the U.S. National Bureau of Standards (NBS) in the mid-1980's, and developed at Cornell University, in Ithaca, New York, from 1987-1997. This article provides a brief description of the method, information about test equipment manufactured by Impact-Echo Instruments, LLC of Ithaca, New York , a description of a new book about impact-echo, and a list of case studies describing a variety of applications. In December of 1997 the American Society of Testing Materials (ASTM) approved a new standard entitled, "Standard Test Method for Measuring the P-Wave Speed and the Thickness of Concrete Plates Using the Impact-Echo Method." This standard will appear in the 1998 Annual Book of ASTM Standards. Impact-echo is a method for nondestructive testing of concrete and masonry structures that is based on the use of impact-generated stress (sound) waves that propagate through concrete and masonry and are reflected by internal flaws and external surfaces. Impact-echo can be used to determine the location and extent of flaws such as cracks, delaminations, voids, honeycombing, and debonding in plain, reinforced, and post-tensioned concrete structures, including plates (slabs, pavements, walls, decks), layered plates (including concrete with asphalt overlays), columns and beams (round, square, rectangular and many I and T cross-sections), and hollow cylinders (pipes, tunnels, mine shaft liners, tanks). The method can be used to locate voids in the grouted tendon ducts of many types of post-tensioned structures. It can provide thickness measurements of concrete slabs with an accuracy better than three percent, and it can locate voids in the subgrade directly beneath slabs and pavements. The method can be used to determine thickness or to locate cracks, voids, and other defects in masonry structures where the brick or block units are bonded together with mortar. When properly used the impact-echo method has achieved unparalleled success in locating flaws and defects in highway pavements, bridges, buildings, tunnels, dams, piers, sea walls, and many other types of structures. Its use has resulted in savings of millions of dollars in repair and retrofit costs on bridges, retaining walls and other large structures. Impact-echo is not a "black-box" system that can perform blind tests on concrete and masonry structures and always tell what is inside. The method is used most successfully to identify and quantify suspected problems within a structure, in quality control applications, such as measuring the thickness of new highway pavements, and in preventive maintenance programs, such as routine evaluation of bridge decks to detect delaminations. 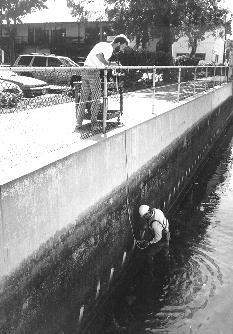 In all of these situations, impact-echo testing has a focused objective, such as locating cracks, voids or delaminations, determining the thickness of concrete slabs, or checking a post-tensioned structure for voids in the grouted tendon ducts. Experience has shown that a thorough understanding of the impact-echo method and knowledge about the structure being tested are both essential for successful field work. The impact-echo method was invented and diverse applications were developed in a relatively short period of time, largely through the efforts of small research groups at the U.S. National Bureau of Standards (from 1983-86) and Cornell University (1987-present). Detailed information about the method and its applications has been available only through technical reports and journal articles of limited distribution. While the term "impact-echo" has gained widespread use, it has been misapplied to other techniques to which it bears little relation. The purpose of this book is to provide a single, comprehensive, authoritative source of information for engineers, scientists, students and others who wish to understand the impact-echo method and make full use of its capabilities. Case studies illustrating the use of the method are presented throughout the book. The traditional, and still most widely used, test methods for concrete and masonry are destructive methods, such as coring, drilling or otherwise removing part of the structure to permit visual inspection of the interior. While these methods are highly reliable, they are also time consuming and expensive, and the defects they leave behind often become focal points for deterioration. Over the past several decades, a range of nondestructive tests, including X-rays, gamma rays, radar, infra-red thermography, and acoustic methods, have become widely used, not only for concrete, but for other structural materials [Malhotra & Carino, 1991; Carino, 1994]. 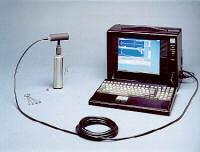 Acoustic methods are the oldest and most widely used form of nondestructive testing. They are based on the propagation, and in some cases reflection, of stress waves in solids. A well known example is striking an object with a hammer and listening to variations in the "ringing" sound to detect the presence of internal voids, cracks or other defects. Three techniques based on stress wave propagation, and differentiated by the methods used to generate and receive stress waves, have been used for evaluation of concrete. They are [2-1]the through-transmission or pulse-velocity method, [2-2] resonance methods, and [2-3] echo methods [Sansalone and Carino, 1986]. We restrict our interest here to echo methods for flaw detection in concrete structures other than deep foundations 1. 1There are a variety of impact-based techniques for testing deep foundations [Malhotra and Carino, 1991]. Figure 1. Schematic of pulse-echo technique applied to the testing of concrete. In echo methods a stress pulse is introduced into the test medium at an accessible surface by a transducer or by mechanical impact. If a transmitter is used, the method is called pulse-echo; if mechanical impact is used, the method is called impact-echo. As shown in Figure 1, in pulse-echo techniques the pulse propagates through the medium and is reflected by material defects or by interfaces between regions of different densities and/or elastic moduli. These reflected waves, or echoes, are monitored by a second transducer coupled to the surface of the test object near the pulse source. The transducer output is displayed on an oscilloscope or similar device. Using the time base of the display, the travel time of the pulse is determined. If the wave velocity in the medium is known, the travel time can be used to determine the location of the defect or interface where the reflection occurs. Since their introduction in the early 1940s, ultrasonic pulse-echo methods have been developed extensively, and have been become an efficient, versatile and reliable nondestructive test method for metals, plastics, and other homogeneous materials. Apart from limited use in detecting flaws in or measuring the thickness of thin concrete members, ultrasonic methods have previously had little success in the testing of concrete, because the high-frequency stress waves they employ (typically 100 kHz and above) are strongly attenuated by the heterogeneous nature of this material. In the early 1970s, impact methods began to be used for integrity testing of deep foundations, such as piles. Hammers were used to generate very low frequency waves (less than 1 kHz) that could be used to determine the length of piles [Sansalone and Carino, 1986; Malhotra and Carino, 1991]. In the early 1980s research engineers at the U.S. National Bureau of Standards explored the use of short duration mechanical impacts, produced by small steel spheres, as a source of stress waves for testing concrete structural elements, such as slabs [Sansalone, 1986; Sansalone and Carino, 1986]. They found that by carefully choosing the diameter of the sphere, it is possible to generate stress waves with frequencies up to about 80 kHz that propagate through concrete as though it were a homogeneous elastic medium, but are reflected from internal flaws and interfaces. Researchers at National Bureau of Standards coined the term impact-echo to describe this method, and to set it apart from pulse-echo methods in which transducers are used to generate stress waves. In the mid-1990s this method was extended to masonry structures [Williams and Sansalone, 1996; Williams, et. al., 1997]. Figure 2. Simplified diagram of the impact-echo method. Impact-echo is based on the use of transient stress waves generated by elastic impact. A diagram of the method is shown in Figure 2. A short-duration mechanical impact, produced by tapping a small steel sphere against a concrete or masonry surface, is used to generate low-frequency stress waves that propagate into the structure and are reflected by flaws and/or external surfaces. Surface displacements caused by reflections of these waves are recorded by a transducer, located adjacent to the impact. The resulting displacement versus time signals are transformed into the frequency domain, and plots of amplitude versus frequency (spectra) are obtained. Multiple reflections of stress waves between the impact surface, flaws, and/or other external surfaces give rise to transient resonances, which can be identified in the spectrum, and used to evaluate the integrity of the structure or to determine the location of flaws. It is the patterns present in the waveforms and spectra (especially the latter) that provide information about the existence and locations of flaws, or the dimensions of the cross-section of the structure where a test is performed, such as the thickness of a pavement. For each of the common geometrical forms encountered in concrete structures (plates; circular and rectangular columns; rectangular, I-, and T-beams; hollow cylinders; etc. ), impact-echo tests on a solid structure produce distinctive waveforms and spectra, in which the dominant patterns-especially the number and distribution of peaks in the spectra-are easily recognized. If flaws are present (cracks, voids, delaminations, etc.) these patterns are disrupted and changed, in ways that provide qualitative and quantitative information about the existence and location of the flaws. A typical impact-echo test system is shown in the adjacent photograph. Its principal components are a cylindrical handheld transducer unit; a set of spherical impactors; a portable computer; a high-speed, analog-to-digital data acquisition system (on a full-sized ISA card installed in the computer); and a software program that controls and monitors the test and displays the results in numerical and graphical form. The entire system weighs less than 14 kilograms (about 30 pounds) and is powered by a 110/220-volt a.c. source or by a 12-volt car or truck battery. Two hand-held units, clamped in a spacer bar, are used to measure wave speed. A single hand-held unit, as shown here, is used for impact-echo testing. I. Basic impact-echo hardware and software, without a computer. Systems Type A and Type B described here do not include a computer, and are designed for users who have suitable computer or wish to select their own. For information on selected complete systems, including a computer, scroll down this page. Click here for general information on computer requirements and recommendations. Book: "Impact-Echo: Nondestructive Evaluation of Concrete and Masonry", by. M. J. Sansalone and W. B. Streett (1997), 339 pp., Bullbrier Press, R.R. 1, Box 332, Jersey Shore, PA 17740, USA. 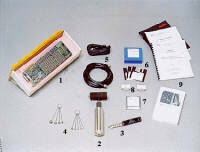 Instruction Manual for impact-echo test system. Software Manual for Imago software system. 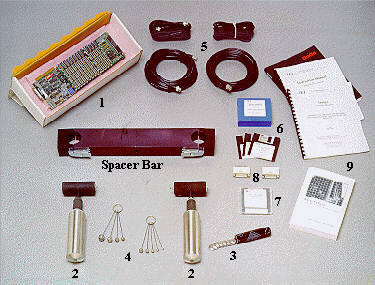 Spacer bar for use with 2 transducers for independent measurements of wave speed. II. Complete systems, with computer included. A file named "demozip.exe" (1.3MB) which contains two demo programs is available for download : (1) an animated simulation of the propagation and reflection of impact-generated stress waves in a concrete slab, which explains the physical principles of impact-echo; and (2) an introduction to the organization and use of Imago software -- the software used with Impact-Echo Test Systems manufactured by Impact-Echo Instruments, LLC. When properly used, the impact-echo method has achieved unparalleled success in locating flaws and defects in highway pavements, bridges, buildings, tunnels, dams, piers, sea walls and many other types of structures. 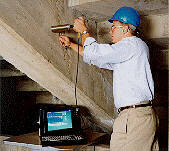 It can also be used to measure the thickness of concrete slabs (pavements, floors, walls, etc.) with an accuracy of 3 percent or better. Impact-echo is not a "black-box" system that can perform blind tests on concrete and masonry structures and always tell what is inside. 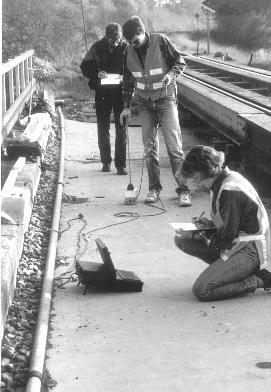 The method is used most successfully to identify and quantify suspected problems within a structure, in quality control applications (such as measuring the thickness of highway pavements) and in preventive maintenance programs (such as routine evaluation of bridge decks to detect delaminations). In each of these situations, impact-echo testing has a focused objective, such as locating cracks, voids or delaminations, determining the thickness of concrete slabs or checking a post-tensioned structure for voids in the grouted tendon ducts. Experience has shown that an understanding of the physical principles of the impact-echo method and information about the structure being tested are both necessary for successful field work. The following case studies illustrate how the impact-echo method and instrument can be used as a condition assessment tool for an engineer involved in evaluation of concrete structures. (One or both of the authors were involved in each of the investigations discussed, often working with the consultant or agency responsible for structural evaluation and repair.) Each of the cases presented includes a description of the structure and the problems to be diagnosed. The role of impact-echo is discussed, and the results of impact-echo testing are summarized. A statement about how the impactecho results were verified is given. 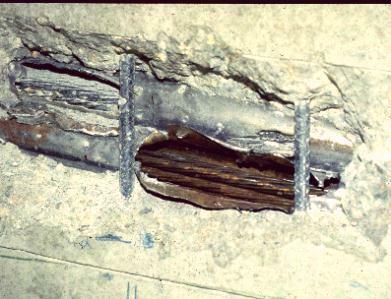 Case Study 1: Cracking in Deck of Reinforced Concrete Railway Bridge, Denmark. 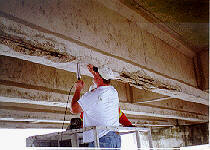 Problem: Structural cracking due to alkali-aggregate reaction in 1-m thick reinforced deck of railway bridge. Results: Impact-Echo tests detected horizontal cracking at mid-depth over entire span. Verification: Cores (and mode of failure during demolition). Outcome: Bridge judged unsafe and demolished. When first hit with wrecking ball, lower half of deck separated almost as one piece, and fell to the ground. Case Study 3: Measuring Thickness of Concrete Pavement in New Highway Test Section, Arizona. Problem: Determine thickness of new highway pavements placed on different sub-bases, including aggregate, permeable asphalt, and lean concrete. Results: Independent measurements of wave speed were used with impact-echo tests to measure thickness at eight locations. Outcome: Uncertainties in measured thickness were 1% for pavement on lean concrete sub-base, 2% for asphalt sub-base, and 3% for aggregate sub-base. Results contributed to preparation of new ASTM Standard entitled, "Standard Test Method for Measuring the P-Wave Speed and the Thickness of Concrete Plates Using the Impact-Echo Method", approved by ASTM in December 1997. 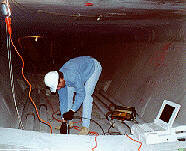 Case Study 4: Locating Voids in Grouted Tendon Ducts of a Post-Tensioned Highway Bridge, Northeastern USA. Problem: Identify areas where there are full or partial voids in the tendon ducts in post-tensioned bridge girders. Verification: Tendon ducts were opened and inspected. Photo (above right) shows duct identified by impact-echo as ungrouted. Outcome: Impact-Echo used to locate voids in grouted tendon ducts throughout the bridge. Empty and partial grouted ducts re-grouted. Case Study 7: Delaminations in Concrete Bridge Deck with Asphalt Overlay, New York State, USA. Problem: Delaminations due to corrosion of reinforcing steel in 200 mm thick concrete deck with 100 mm asphalt overlay. Results: Impact-Echo identified extensive areas of delamination at top layer of reinforcing steel. Outcome: Concrete deck repaired and new asphalt overlay applied. Case Study 8: Cracking in Beams and Columns of Parking Garage, New York State. Problem: Cracking in columns and at flange-web intersections of T-beams, due to asymmetrical design and loading. Results: Impact-Echo identified cracks at flange-web intersections in certain T-beam configurations, determined extend of cracking in columns, and confirmed that solid cores existed in some cracked columns. Verification: Expansion joints in slabs removed to expose cracks in T-Beams. Outcome: Impact-Echo test results used to design and implement comprehensive repairs. Case Study 9: Locating Hidden Headers Behind Masonry Facade of 13-Story Building, New York City. Results: Impact-Echo was used in exploratory tests to determine presence or absence of hidden headers. Verification: Brick facing removed in test areas to verify impact-echo results. Outcome: Impact-Echo tests were 100% accurate in locating headers. The method was recommended as part of testing and rehabilitation program for the building facade. This book draws together all available knowledge and information about the impact-echo method and presents it in a concise and logical format. This information has previously been available only in technical reports and journal articles published between 1986 and 1997. Following a brief introduction and review of the development of the method, five chapters are devoted to the physical and mathematical principles on which impact-echo is based, followed by seventeen chapters on applications and case studies. The case studies include photographs, drawings and impact-echo results from field tests on a wide variety of concrete and masonry structures. Professor Mary J. Sansalone1 (PhD, Cornell) is the principal inventor of the impact-echo method, and a leading authority on the use of transient stress waves for nondestructive evaluation of heterogeneous materials. She has received numerous awards for research and teaching, including the Wason Medal for Materials Research from the American Concrete Institute, a Weiss Presidential Fellowship from Cornell University, and the U.S. Professor of the Year Award from the Council for Advancement and Support of Education (CASE) and the Carnegie Foundation. She shares a patent with one of her former graduate students for a portable, computer-operated system for impact-echo testing in the field. 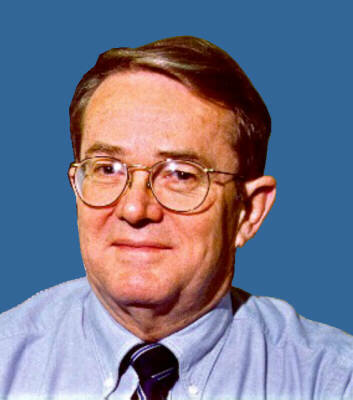 William B. Streett (PhD, University of Michigan) is the President of Impact-Echo Instruments, LLC, a company that manufactures and markets impact-echo test equipment. He is a graduate of the U.S. Military Academy at West Point, New York, where he was a member of the faculty for 15 years. He was a member of the faculty of Cornell University from 1978-95, and was Dean of Engineering from 1984-93. In addition to his work on the impact-echo method, his expertise includes computer simulations of molecular liquids and experimental studies of fluids at extremes of pressure and temperature. He conducted research at Oxford University under a NATO Fellowship, and later under a Guggenheim Fellowship. He is the author of the software that is used with the impact-echo field unit manufactured by his company. 1 Mary J. Sansalone is a Professor of Civil Engineering at Cornell University in Ithaca, New York. She has no involvement with commercialization of impact-echo, or with the company, Impact-Echo Instruments, LLC, mentioned in this paper.